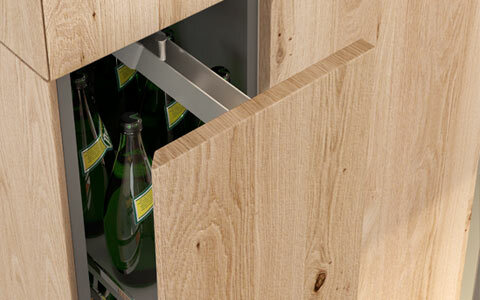 What separates a good kitchen from a great kitchen is attention to the details. At Two Tone Kitchens we don’t overlook any aspect of your kitchen. We believe in combining design with practicality to create your dream kitchen. We are specialists in bespoke kitchens and this allows us to fully customise any aspect of your kitchen. Our wood veneer options allow us to create book matched door fronts. We can achieve book-matching using veneered wood fronts in both vertical & horizontal directions. Being a 100% bespoke kitchens, our kitchen doors can be supplied in several different door profiles. Solid & Metallic colours can be supplied in J-Pull handle, Undercut, Slab, Chamfer & Vertical bevelled edge profiles. 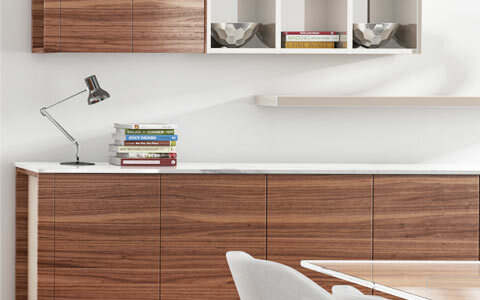 Wood veneered options are offered in J-pull, Slab, Chamfer, and Vertical bevelled edge profiles. 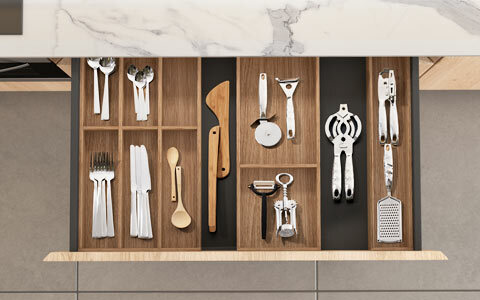 Kitchen shelving creates modern & sophisticated kitchen decor. 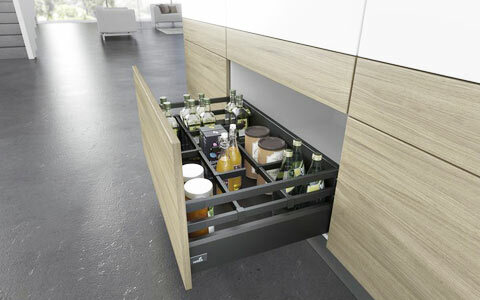 Primarily designed to maximise space usage in the kitchen, kitchen shelving creates freedom of movement as well as making your kitchen look bigger. When it comes to choosing the colour of shelves, choose between colour finishes that match your walls to create a seamless look or in contrasting colour to make them the focal point of your kitchen. Kitchens are one of the places where for some reason we always have more things than we require. 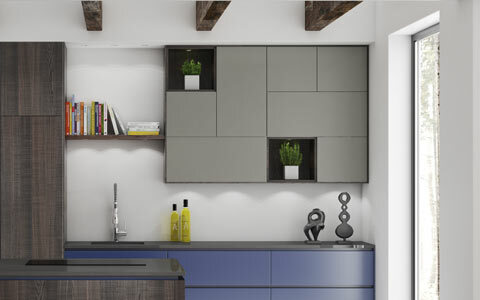 To help you make the most of space available, our kitchens come with a wide range of modern drawer & kitchen storage options. 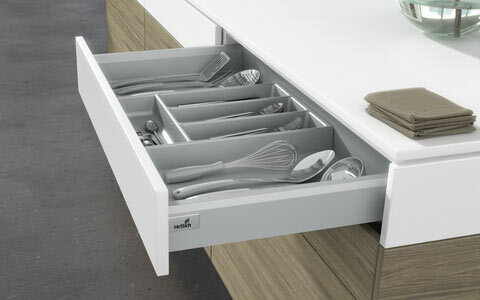 We have selected Hettich & Blum, made in Germany, for our kitchen drawers which are known for their quality and versatile drawer variations. It’s the small points that set your kitchen apart. Choose our wooden cutlery trays for that premium luxurious feel. Made out of finest Oak and available in wide range of sizes. Kitchen elements are screwed to the wall and often do not receive as much as light as other household furniture. 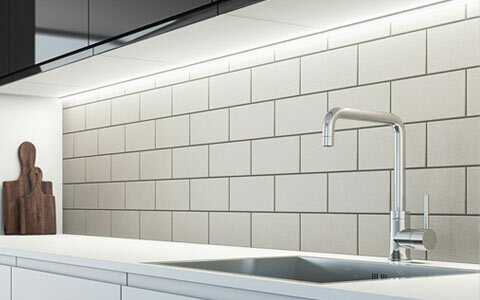 Kitchen lighting is designed to bring much needed light to your kitchen area. In particular food preparation area of your kitchen requires good lighting. When it comes to your kitchen we take into consideration three main types of lighting. The mood lighting, work lighting & ambiance lighting. We offer selection of drawers in four different colours. Choose between anthracite, champagne, silver or white coloured drawers. Our drawers feature solid sides which makes them durable & strong. Our traditional kitchens offer a large number of decorative features. 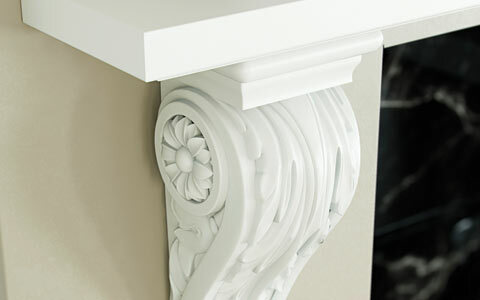 Features such as mantels, corner posts & pilaster are first machined then hand carved to create the desired shape. These decorative features add to the luxurious & premium feel of your traditional kitchen. 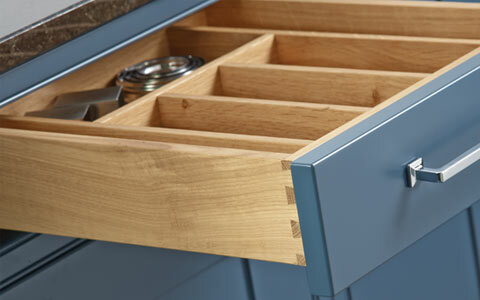 Our drawer boxes are manufactured using the finest quality oak and traditional dovetail joints to guarantee a long-lasting and robust product. Fully comparable with Blum Tandem & Grass Dynapro runner systems. Available in 90mm or 150mm high or can be manufactured to bespoke specifications.